Through two weeks, Julius Peppers has only mustered 1 solo tackle and looks to have genuinely lost a step. I'm not saying to go out and dump him in every league, but it's time to take a serious look at what's available on your waiver wire in shallow leagues and upgrade if possible. Kroy Biermann and Charles Godfrey both went down with season-ending injuries in Week 2. Additionally, Tyvon Branch suffered an ankle injury that will likely cause him to miss a significant chunk of time. After a strong Week 1 performance (5-4-0), Nick Roach completely disappeared in the box scores in Week 2. Only 16 rushing attempts by the Jags created very little tackle opportunity for the linebackers as Kevin Burnett led that group with 3 total tackles. Roach seemed to be involved in a few tackles, but was not credited. All this said, I wouldn't overreact too strongly to this poor performance. Roach may not be the LB1- we thought he was entering the season, but I still like him as a LB2-/LB3+. Hot Week 2 Waiver Wire Pickup, Duke Ihenacho was carted to the locker room with an ankle injury in the Broncos Week 2 face off against the Giants. He later tweeted that he feels "fine." Assuming he practices Wednesday or Thursday, he should be good to go for Week 3. Despite a primo matchup, Donald Butler fell flat on his face with only 2 solo tackles against the Eagles this past Sunday. He's a player that has LB1 talent, but until he can show more consistency, he falls back into the LB2 tier. The NFL suspended Dashon Goldson one game for his illegal helmet-to-helmet hit on Darren Sproles. Ahmad Black will likely get the start in his place and isn't really a viable fantasy option. Falcons WLB Sean Weatherspoon has been diagnosed with a foot sprain. It's not believed to be serious, but these type of injuries tend to linger. We will monitor this situation closely. If he can't go, Akeem Dent gets a good bump in value. Although he led the team in solo tackles, Roman Harper was still absent in base packages. He's a good enough fantasy player to still be a starter in most leagues even only playing 70-80% of the snaps, but he's going to have a hard time repeating his claim as an elite DB1 if this trend continues. 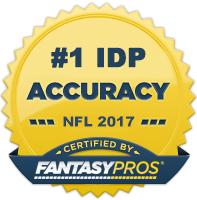 Now onto The Guru's IDP waiver wire selections for Week 3! DE/DT Michael Bennett (SEA) - After a strong season 2012 campaign with Tampa Bay, Bennett has quickly become the forgotten man in Seattle playing behind pass-rushing threats Cliff Avril, Bruce Irvin, and Chris Clemons. Bennett is probably the best run defender of that group however and nearly notched double digit sacks a year ago. After laying a goose egg in Week 1, he came in with 4 total tackles (2 for loss) and a sack against the 49ers on Sunday Night Football. Additionally his snap count percentage increased up to nearly 80%. He has a good chance for a sack this week against the anemic Jaguars offensive line. Make sure to watch Chris Clemons' game status for this week as it may affect Bennett's playing time to a certain degree. LDT Jason Hatcher (DAL) - Hatcher has sneakily developed into the Cowboys best interior pass rusher over the last couple of seasons and seems to be thriving in Monte Kiffin's newly-installed Tampa 2 inspired defense. With Jay Ratliff on the PUP list, Dallas will continue to rely heavily on the 8 year veteran to play 75-80% of the snaps. This makes him a fairly solid DT1-/DT2+ choice for those in tackle-required leagues. LDE Brian Robison (MIN) - Outside of his defensive touchdown last week against Da Bears!, Robison has been quiet so far this season. However, if you've owned him in the past you know that he gets his sacks in bunches and typically against bad offensive lines. That said, this is the week to pick him up. He goes against Cleveland who has already allowed 11 sacks and 27 QB hits in only two games! Very nice matchup play this week. RDE Adrian Clayborn (TB) - Somebody has to start producing on Tampa's defensive line and it doesn't look like it's going to be DaQuan Bowers. Clayborn had success as a rookie in 2011 with 7.5 sacks before an injury halted his 2012 campaign early. He's back and seems fully healthy now and registered 5 total tackles to go along with a sack last week. He's never going to be an elite pass rusher, but he has a good motor and plays the run well which should allow him to shoot for a 30/15/8 season. WLB Phillip Wheeler (MIA) - This is an "off the top" recommendation for those in shallower leagues as Wheeler is most likely rostered in moderate to deeper leagues. He played exceedingly well in Oakland last year and the 28 year old has shown no signs of slowing down in Miami. With lines of 6-0-0 and 8-4-1 in the first two weeks, respectively, Wheeler is shaping up to have another potential 80/30/4 season. ILB Pat Angerer (IND) - After a strong 2011 fantasy performance, an early season injury and inconsistent play caused Angerer to fall out of favor with the coaching staff in Indy. It seemed as though Angerer's role as a rotational player was going to carry into this year until midway through the preseason when he was officially announced as the starter next to Jerrell Freeman. He missed the first regular season game due to injury, but was back in full force last week with 11 tackles (8 assists) and 0.5 sack last week. If you are in a league that doesn't reward for assists, then heavily discount Angerer's value as the Colts' scorekeeper hands them out like candy often times in lieu of solo tackles. For those with typical scoring systems, now is a good time to add Angerer as an LB4. ROLB Geno Hayes (JAX) - Hayes continues to see all of the nickel snaps alongside Paul Posluszny. With the Jaguars offense unable to sustain drives, the Jacksonville defense is seeing a good amount of tackle opportunity. Hayes, although a middle of the road NFL talent, seems to be taking advantage of this optimal fantasy situation. He had 10 total tackles last week and has a strong matchup this coming week against Marshawn Lynch and the Seahawks. If you do decide to pickup Hayes as a streaming option, it's important to watch his snap counts closely (or check out the 2013 Every Down Linebackers post) as my gut tells me Russell Allen takes away that nickel role from Geno at some point during the season. WLB Danny Trevathan (DEN) - With 10 total tackles and a sack, Trevathan will be on the waiver wire short list of many an IDP owner this week. He's still not playing every down, so there is some risk with picking him up. That said, don't overvalue him at this point (I wouldn't prioritize him over a guy like Angerer), but he will probably see a good amount of snaps against Oakland this week as they don't force many defensive subpackage looks. SS Aaron Williams (BUF) - A lot of the waiver wire attention has been focused on Williams' teammate Da'Norris Searcy; however, Williams is the full-time starter at strong safety and has posted strong tackle numbers in both weeks of the season. Expect that strong tackle production to continue making Williams a nice DB1 candidate in tackle-heavy leagues. SS Quintin Mikell (CAR) - This is more of a stash suggestion as Mikell suffered an ankle injury of unknown severity in last week's game and with the Panthers' bye week looming in Week 4, there's a very good chance Mikell may not play again until Week 5 at the earliest. However, with Charles Godfrey out for the season, Mikell becomes the most dominant player in Carolina's secondary and although he plays behind a very strong front seven, he's a strong enough performer to have value as a DB3-/DB4+ in most weeks when healthy. SS Usama Young (OAK) - It appears as though Tyvon Branch is going to miss "significant" time with an apparent fractured fibula suffered in last week's game. The next man up will be Young who posted 4 total tackles and 1.5 sacks while filling in for the injured Branch in Week 2. Not sure if Young is capable of the same type of numbers Branch has historically produced, but he's sure to see a good amount of tackle opportunity playing on the Raiders' defense. He's worth a flyer as a DB3 in deeper leagues. CB Robert McClain (ATL) - Teams are often forced to throw a lot against Atlanta to keep up with their vaunted passing attack. This means more tackle opportunity for the cornerbacks, especially mediocre ones like McClain who has put up 8+ solos in back to back weeks. Expect teams to continue to pick on the former 7th round pick out of Connecticut. Ride the wave until it crashes. FS Barry Church (DAL) - I've admittedly been lukewarm on Barry Church, but after watching every snap of the Cowboys/Chiefs game in detail, I'm beginning to change my tune on him a bit. He's still not a dynamic player by any means, but he's been coming down in the box and was aggressive in stopping the run. Two weeks of 7 solo tackle production place him into consideration as a serviceable DB3. Just be aware he's not historically been a big play producer and will have some dud tackle weeks with Sean Lee and Bruce Carter playing in front of him.